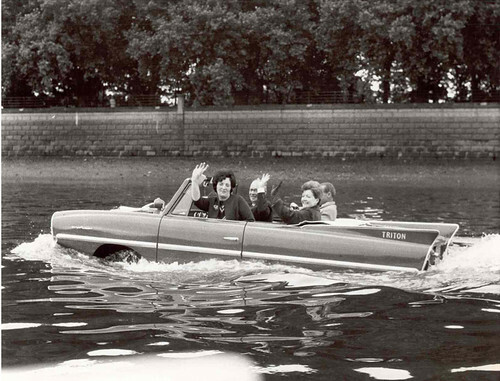 Driving your car on your local river may seem unnecessary, unless you want to avoid your usual traffic jams, or to take out your girlfriend on a river cruise with a backseat. 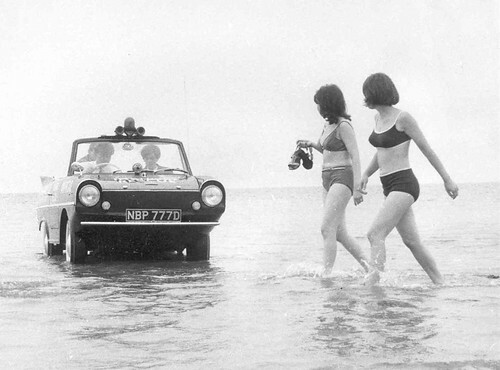 Our "Future Tech" contributing writer Paul Schilperoord, whose recent book on "exciting innovations in transportation" you can order here, compiled an overview of great amphibious cars (available today!) 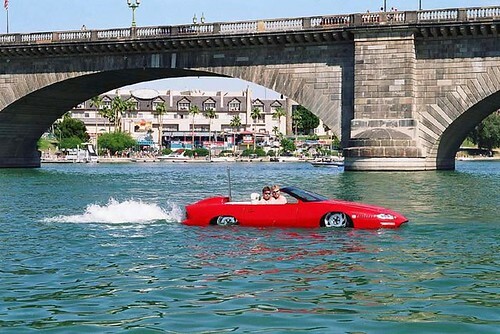 that just might inspire you to cut short your motoring on land and venture out into the water. 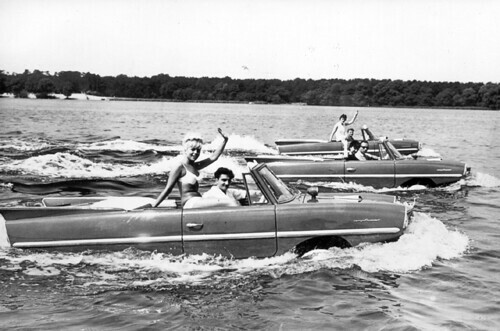 Amphibious cars have been around for many decades. 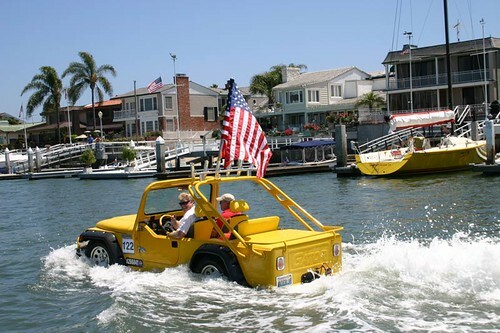 In fact, the American inventor Oliver Evans built the first self-propelled amphibious vehicle as early as 1805. 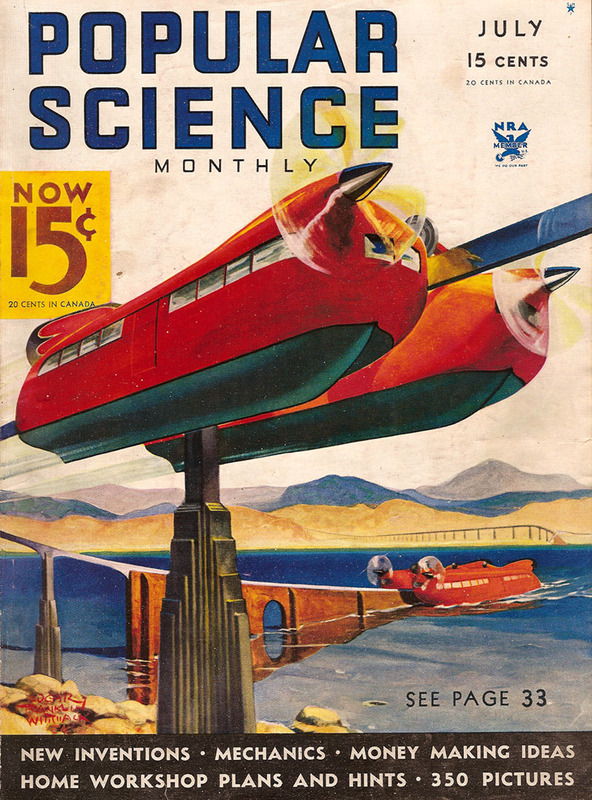 His design consisted of a wooden hull fitted with a steam engine and wheels. 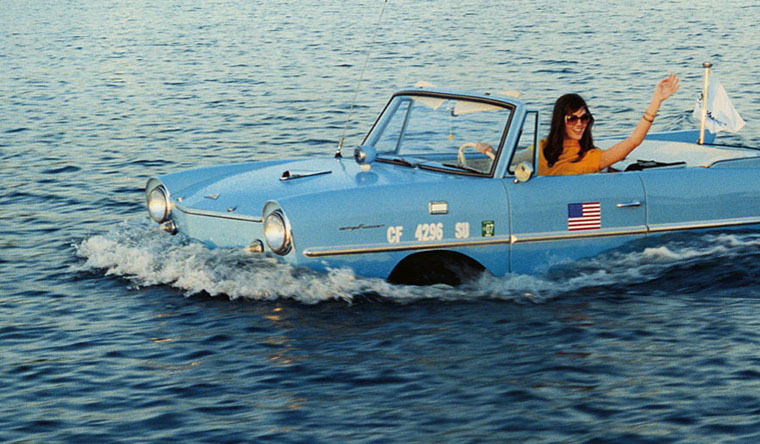 But it wasn’t until well into the twentieth century that amphibian vehicles found their use, mainly for military applications. 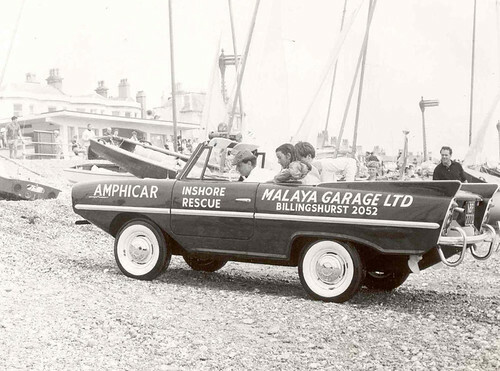 In recent years a couple of amphibian cars were created using modern technology to reach much higher speeds. These include the Aquada from the British company Gibbs Technologies, capable of 160 kilometres per hour (100 mph) on land and 55 kilometres per hour (30 mph) in water. 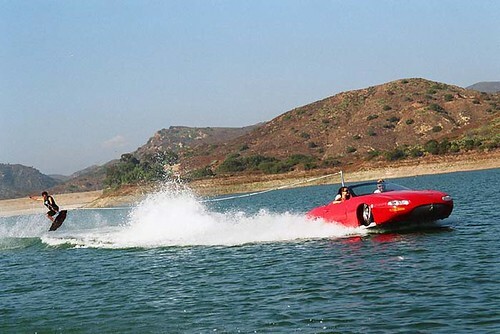 Another high-speed amphibian is the Rinspeed Splash which utilizes hydrofoil technology, allowing the body to be raised out of the water. 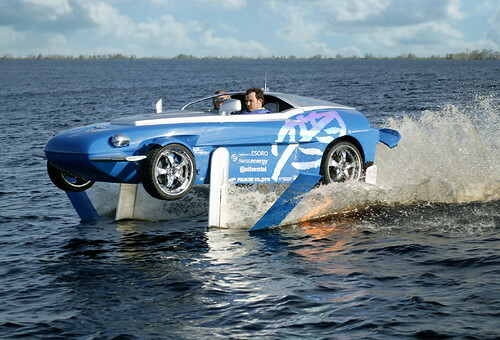 Using hydrofoils this vehicle can reach 80 kilometres per hour (50 mph) on the water and as a sports car 200 kilometres per hour (125 mph) on the road. 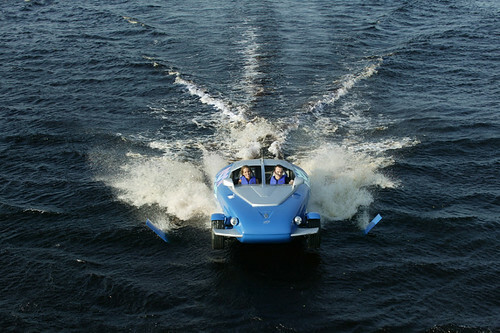 The Aquada is the fastest amphibian vehicle ever built, equipped with HSA (High Speed Amphibian) technology from the British company Gibbs Technologies (in production since 2003). 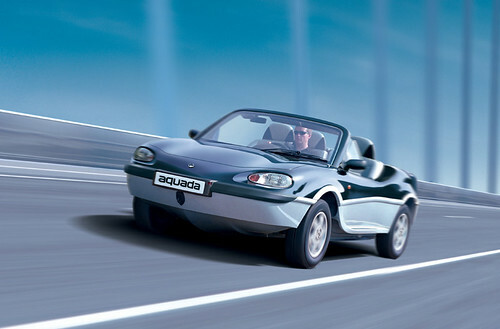 On the road, the Aquada handles like a sports car, capable of a maximum speed of 160 kilometres per hour (100 mph). The vehicle is equipped with a mid-mounted V6 petrol engine, which drives the rear wheels. 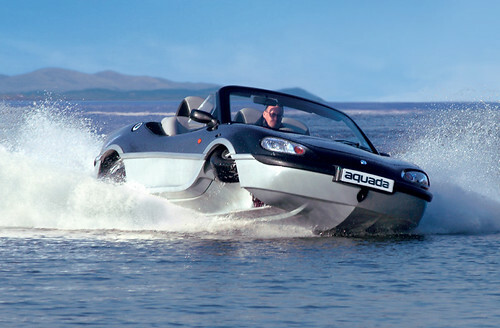 For conversion to a speed boat, the Aquada can simply be driven into the water from a ramp. 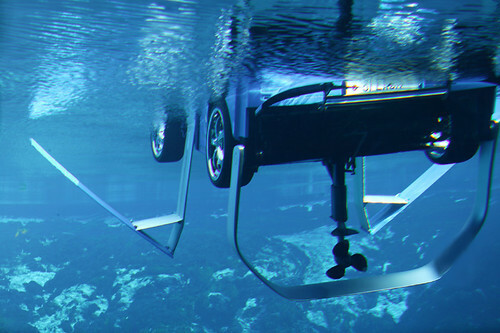 Once the vehicle reaches deep enough water, the computer controlled hydro-pneumatic suspension unit collapses all four wheels upwards into the wheel cases. 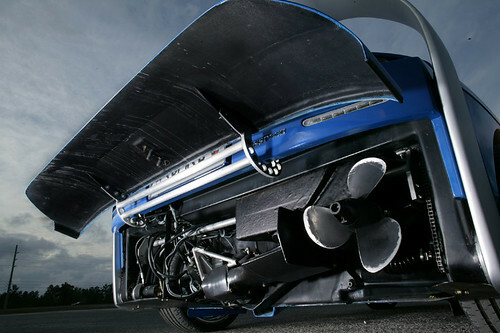 The engine is directly coupled to a waterjet, capable to propel the vehicle up to a maximum speed of 55 kilometres per hour (30 mph). For optimum performance, the underside of the Aquada is fully streamlined while the waterjet is completely integrated into the vehicle body with no protruding parts. 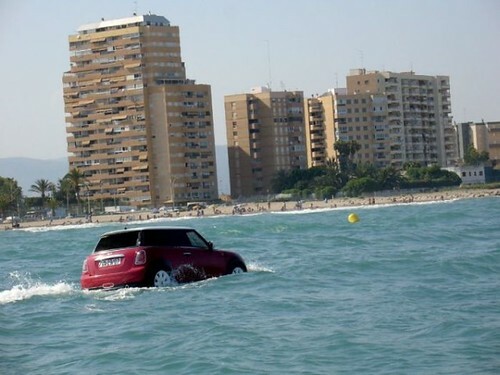 Transformation from car to boat takes just 6 seconds. 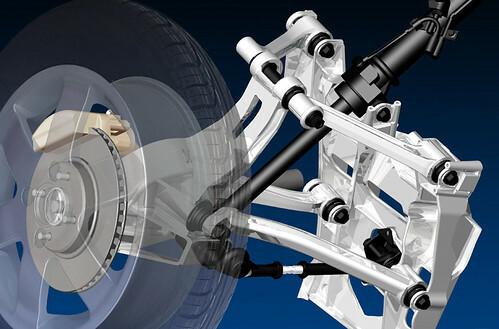 On the road, a dual sensor system and additional magnetic locks prevent the wheels from collapsing into the wheel cases. The driver sits in the middle of the car, with a passenger seat at either side. Seats can be elevated for improved visibility on water. 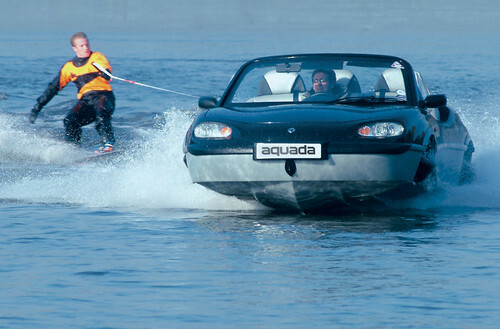 The Aquada is the first application of the HAS technology. 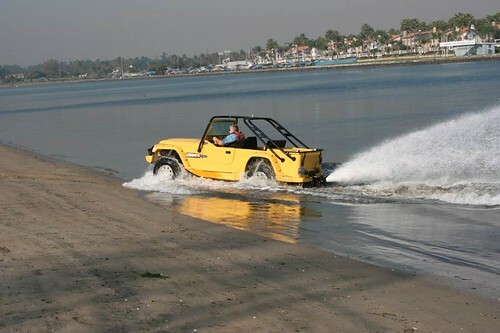 This amphibious drive system can be transferred to vehicles of all sizes and a great number of applications. Gibbs Technologies aims to license the technology to higher volume manufacturers to make the technology more widely available. ACCELERATION 0-96 KM/H (60 MPH): 10 sec. 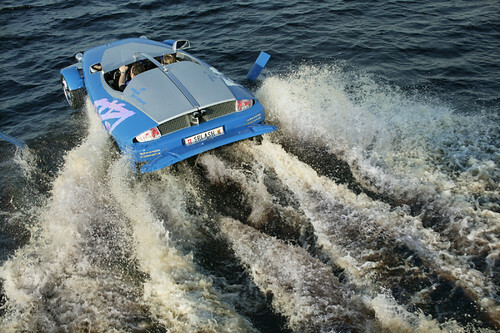 The Rinspeed "Splash" is a unique amphibian sports car with hydroplaning abilities. 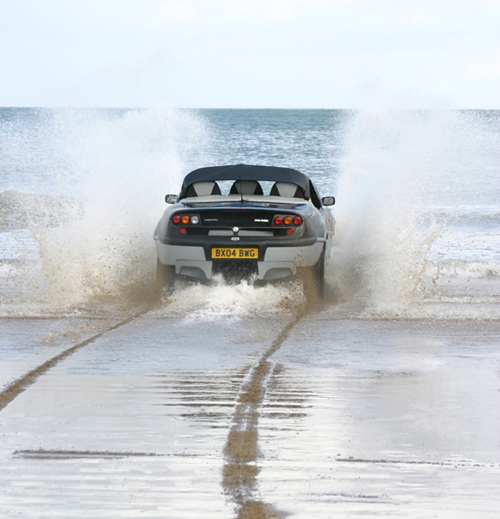 On the road the vehicle is capable of a maximum speed of 200 kilometres per hour (125 mph). 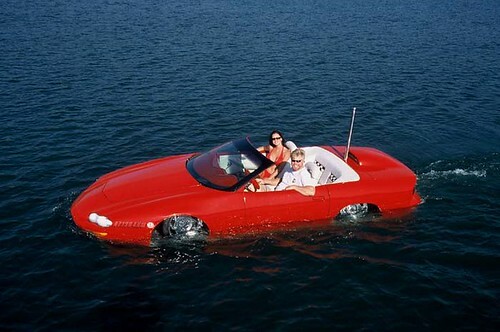 To use it as an amphibian, the driver simply drives the vehicle into the water and at the push of a button, a hydraulic mechanism transforms the sports car into an amphibious vehicle. 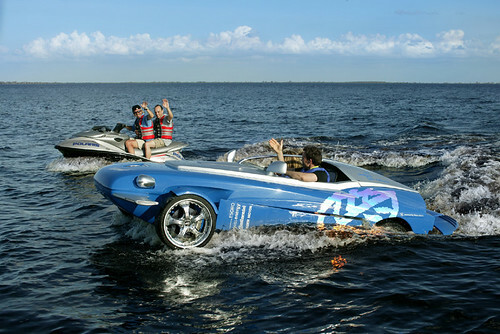 First the rear panel of the vehicle flips up to reveal a Z-drive, adapted from a watercraft, resting in horizontal position. 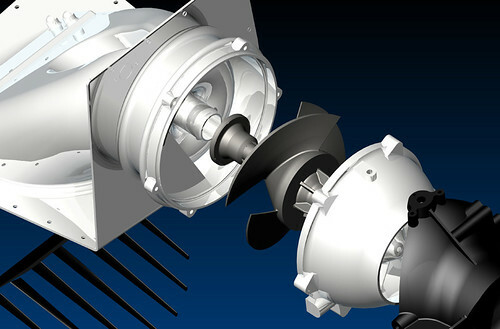 The Z-drive has a three-bladed propeller and can be lowered into the water. It can reach its fully standing vertical position in a water depth of about 1.1 metres (3.6 ft). 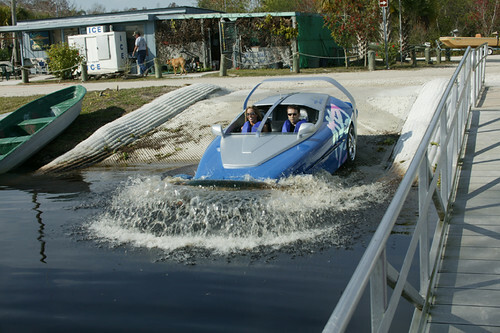 The Splash is powered by a 750 cc engine running on natural gas. Engine power is sent to the rear wheels, the propeller or both, depending on the required propulsion to further enter the water. Steering commands from the steering wheel are transferred to the Z-drive. At a minimum water depth of 1.3 meters (4.3 ft) a system of integrated hydrofoils can be lowered into the water. 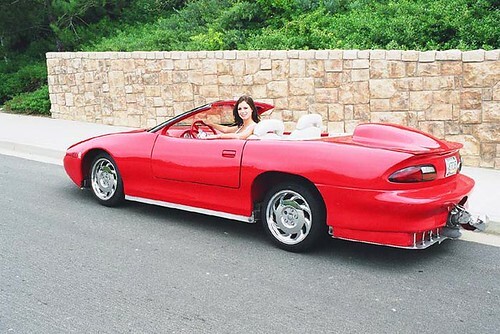 At the rear of the vehicle the large spoiler rotates 180 degrees downwards until it standing underneath the body. At the lift and right hand side of the cockpit two hydrofoils rotate 90 degrees downwards and unfold into a V-shape. 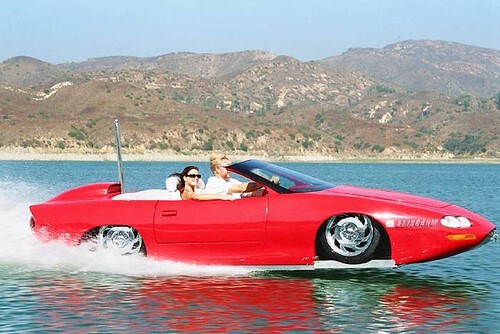 Under normal driving conditions these hydrofoils are folded down against both sides of the vehicle. Even at slow speeds the hydrofoils start to lift the Splash out of the water. It reaches its fully suspended position from speeds around 30 kilometres per hour (19 mph), "flying" approximately 60 centimetres (2 ft) above the water surface. With retracted hydrofoils the Splash can also be operated as a "conventional" amphibian with speeds up to 50 kilometres per hour (30 mph). ACCELERATION 0 – 100 KM/H (62 MPH): 5.9 sec. Designed to traverse the deserts of Turkmenistan (and to bring economic development to the area rich in natural resources), this Soviet "dream train" would turn into a boat for the independent crossing of major rivers. This project is so deliriously bizarre, that no retro-tech enthusiast can fail to get excited by it, for no apparent practical reason. 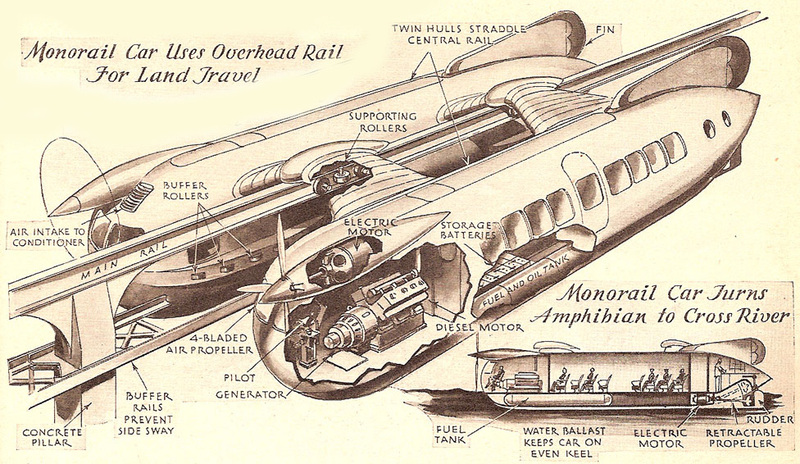 This "boat-train" idea may seem a little far-fetched, until you consider the projected link between Siberia and Alaska: a fleet of amphibious transport vehicles could be a viable alternative to building a costly tunnel. How about the German WWII Schwimmwagen?